Rewind to the end of summer, 2016. It’s the downwave of two years of intensity. A time when racial justice protests, meetings, convenings, disruptions happening by the hundreds - most things new and invigorating! - were the norm. But now, after the near-simultaneous July murders of Alton Sterling and Philando Castile, and the depressing frustration of nearing elections, public attention and mass action has begun to wane. Until, suddenly, the masses seem to FULLY awake in November 2016 with the election of 45. But, just as quick - as evidenced by the fleeting safety pin movement - it became clear: many didn’t know quite what to *do* with their new ‘wokeness’. Enter Project Allies in Motion. Created by Jay-Marie Hill, a Black, Queer Artist & Organizer eager to share the tools of the Movement with the masses, #ProjectAIM formed in early 2017 hoping to fill a void left gaping by social media and other emerging technologies. With funding support from Emerging Arts Professional's MADE Grant to cover supplies, registration subsidization, catering and facilitation fees, a learning container was created for well-meaning onlookers to practice what it meant to be not just “Allies” to social movements, but “Allies in Motion”. At the 2017 Bay Area #ProjectAIM workshops—held in January, May, and July—participants were treated to feasts of ideas, actions, music, and delicious homemade meals. 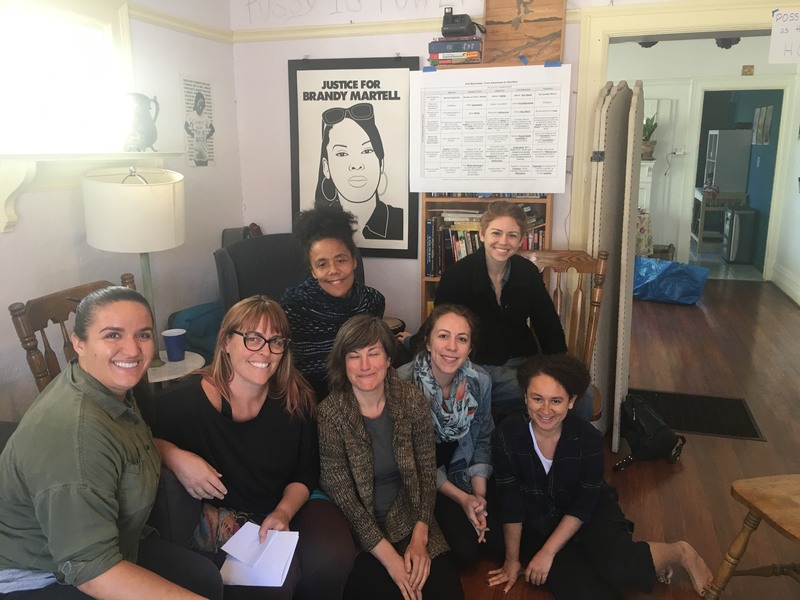 Upon arrival to the homes where the workshops took place, participants were greeted by facilitator Jay-Marie Hill's warm voice, singing a welcome song of resistance and compassion. With bellies full, altars blessed, and the room warm, Jay-Marie begins to facilitate. They start with a series of exercises designed to help the room viscerally understand “social justice words” like anti-Blackness, intersectionality, and transphobia. Jay-Marie regards each person in the room as experts of their own experience, yet also encourages rigorously honest self-reflection throughout. Participants go on to investigate historical examples of systemic anti-Blackness and Black resiliency, examine their own marginalizations as a tool for empathy, and brainstorm the ways in which their specific privileges and social locations allow them unique tools they could bring to the work of “movement”. Upon finishing a meal together, now full of laughter and new learnings, they close by joining in singing an original song written by Jay-Marie; a song of freedom. "Jay-Marie is an outstanding facilitator with a nuanced, compassionate approach, the kind of person who leads you to powerful "aha!" moments and shifts in your own thinking. She has a great understanding of leading people to action where they are, and the workshop was an incredibly motivating experience." While our fears may say to us - tomorrow, tomorrow! - let us be bold and begin today. If we are going to survive this moment, it must be through our work together. There is no twitter substitute for a home-cooked meal that warms your insides; no facebook status worth the sweetness of someone inviting you into their home. There is no magical number of likes online that can equate to being a welcomed member of a collective, actively lifting its voice in song; resisting through the language of angels. #ProjectAIM offers this and so much more. As this year has shown us loud and clear, the political world is going to keep moving. If we are to live in this same world, we must keep moving and growing with it. #ProjectAIM offers us a space to do this, and what’s more, reminds us that we cannot give up our ability to imagine - with precise clarity - the love and justice we want to see. To envision, is to remember: we deserve better. And so while our fears may say to us - tomorrow, tomorrow! - let us be bold and begin today. And everyday again, thereafter. Check out this video preview of #ProjectAIM’s offerings and contact them through musicfreedomdreams.com if you’d like to host a #ProjectAIM workshop in your home. A “creative mind asking the questions that will shape the future of culture”, Jay-Marie Hill is a genderqueer artist n renegade. They are a singer-songwriter, multi-instrumentalist, educator, and organizing strategist that lives the struggle of creating the world anew. Whether participating in frontline activism, performing music, or helping others birth new possibilities beyond gendered and racialized norms, Jay-Marie pushes audiences to think bigger, question better, and love a little harder along the way. MADE is a re-granting & project incubator program that draws upon the inspiration and power of the network to propose and execute projects that addresses immediate solutions of the day—widely ranging from new social modeling, to practices around life/work balance, to new ventures on system theory, to innovative ways of building smarter communities. MADE is, at its core, an actionable, flexible forum that drives exploration, prototyping, and knowledge sharing. Learn more at emergingsf.org/made.